"The Many in One Series"
Stencil print on cotton pillow case, pillow. "The Many in One Series" are diverse works using print techniques to produce a repeated motif (with variations) within the same image. Most of these work are lyrical statements often with conceptual twist such as "Gaia's Pillow". 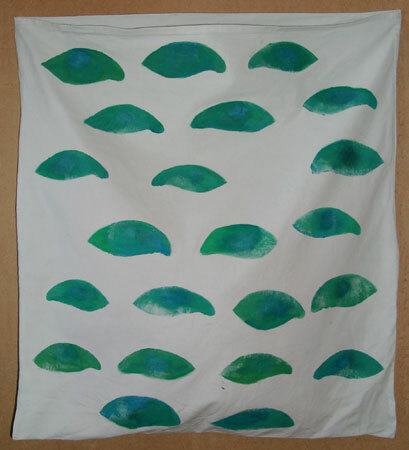 Here wakeful green eyes, or leaves, hover over a pillow. Gaia is the Greek goddess of the earth often personified as mother earth. A repeated motif functions much like a fractal which is created by the repetition (or reiteration) of a pattern or formula. The "Experiments with fractals" is a new work we are still experimenting with, using print techniques and programming (for an animation or interactive work).